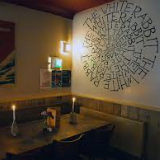 The White Rabbit is a quirky little pub situated in the North Laine a little off the beaten track. The name is intriguing and so is the interior and the clientele, with a hint of grime, in a good way! It’s one of those pubs in which you can while away the hours just staring at the decor – one wall is covered with clocks, all set at different times; there is an eclectic mix of art work ranging from black and white portrait photos, to an modern art take on Elvis. All in all, its eclectic, grimy and fun, a pleasant change from the sterility of many a modern drinking establishment.